On the other side of the world our Malaysian partners are hard at work making sure that tigers are protected and thriving in the wild for many generations to come. Just last year local people monitored over 8,000 miles of tiger home range resulting in the confiscation of hundreds of poachers’ traps, protecting the Malayan tiger and many other animals from harm. Thanks to long-term anti-poaching efforts like these, the Malayan tiger population in Endau-Rompin appears to be stable or slightly increasing! The Houston Zoo is inspiring the next generation of saving wildlife heroes. One way we are achieving that goal is by forming lasting partnerships with school groups in and around the Houston area through animals. Each partnership looks a bit different from one another, but they all have one thing in common: they are inspiring students, teachers and communities to take action to save wildlife! MacGregor Elementary is an example of one school that is partnering with the Houston Zoo to save tigers through the Mascot Program. The partnership between MacGregor Elementary and the Houston Zoo started in 2017 when students raised over $1,400 to support local people in Malaysia watching over tigers in the wild as part of the Zoo’s tiger conservation efforts. The school continued their efforts in 2018, hosting their annual Tigers Saving Tigers campaign last fall raising an additional $2,100 to help save tigers in the wild! This school year the campus added another component to their partnership – the robotics club worked with Houston Zoo Carnivore keepers to design and build an enrichment item for Berani. 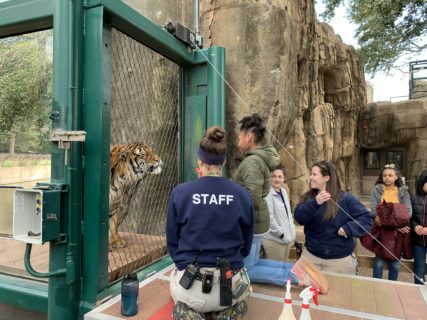 As a thank you for their incredible efforts, students have had the opportunity to visit the Zoo and participate in tiger encounters, as well as receiving a school visit from the Zoo’s SPARK team! 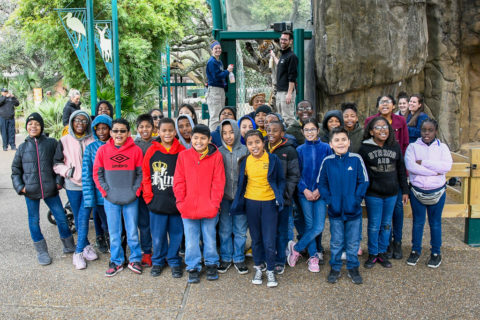 This week Dr. Johnson’s class had the opportunity to meet the Zoo’s tigers with our Carnivore keepers, getting a special experience with the species they are helping to save. Share via Facebook: MacGregor Elementary Tigers are Helping Saving Tigers in the Wild! Share via Twitter: MacGregor Elementary Tigers are Helping Saving Tigers in the Wild! Share via Linkedin: MacGregor Elementary Tigers are Helping Saving Tigers in the Wild! Share via Email: MacGregor Elementary Tigers are Helping Saving Tigers in the Wild!